We invite you to explore India - the Land with infinite beauty ! Whether you soar high into Himalayas or peer under the ruins of the Ancient monuments dotting the landscape of India, you will cherish the experience long after your visit ! This India Travel Guide on Chail is free from any commercial interest! This site is dedicated to promote India - the vast subcontinent, its glorious past, magnificent landscape and its infinite variety. Situated in Himachal Pradesh, Chail is a small charming hamlet where time seems to stand still. Located amidst scented forests of pine and gigantic deodars, Chail is located on three hills - the palace is on Rajgarh hill, the Residency Snow view which was once occupied by British nationals on Pandhewa hill and the third hill, Sadh Tiba where Chail is situated. Overlooking Sutlej valley, Shimla and Kasuli are also visible from here. The story goes that Maharaja Bhupinder Singh of Patiala incurred the wrath of the then Commander-in-chief, Lord Kitchener. Hence, he was banned from entering the summer capital of the Raj. The enraged Maharaja created his own summer capital. He located Chail, a little village close to Shimla with the snow-laden mighty Himalayas bearing down. Significantly, Chail was higher than Shimla town. He rebuilt the city to suit his interest and also built a marvelous palace for himself. Today this palace is run as a heritage hotel. In 1972, it was taken over by the Himachal Pradesh Development Corporation and since has become a luxury resort nostalgic of its heritage and yet combining the modern facilities to provide a getaway for honeymooners. Interestingly, Chail has the highest cricket ground in the world. It is well kept and maintained; with huge trees of deodar and pine. Maharaja Bhupinder Singh was himself an avid cricketer and the teams that have played include the MCC. On the other side of Chail, a discerning visitor can glimpse the massive snow capped Himalayan ranges gleaming under the sun. With the majestic Shivalik peaks and beautiful orchards and sylvan pine valleys, a visitor to Chail is sure to be captivated. A view of the Chail valley is magnificent. Looking down the valley with river Sutlej winding its way between the mountains is awe-inspiring. And in the evenings, distant lights cast their magic charm as if creating a pattern on the horizon. The mountain peaks of the great Himalayas have been described and odes sung by poets from time immemorial. Anybody would be awestruck to see the massive Himalayan ranges. Hyacinth and celandine decorate the meadows and carmine and rhododendron trees surround the forests of deodar and towering pine trees. A must see on the list of tourist spots is of course the palace of the Maharaja on Rajgarh hills. Spread over a sprawling property of 75 acres, including its peripheral cottages, woods, sport and recreation facilities, it is now a fully fledged Palace hotel retaining the grandeur of its princely past, with its large elegant lawn, pavilion and fountains. A small wildlife sanctuary lies about 3 km from Chail, which has ghoral, kakkar, sambhar, red jungle fowl, and khalij and cheer pheasants. 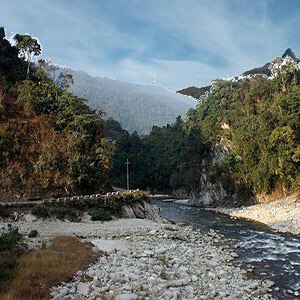 Kufri is a popular station that can be reached by an enjoyable drive through forests and small villages. Nature Park at Kufri is a great attraction. A short trek takes the visitor to the Mahasu peak with its breathtaking views. Between Kandaghat and Chail lies Sadhupul, a picturesque village which is a good picnic spot. There are a dozen routes to trek out of Chail. Trails lead up to the Choor Peak and to Shimla. Fishing on Giri River at Gaura, about 29 km away is common. There are a few hotels on the hills and Chail's mall has some shops and hotels on one single stretch. The log huts are a fascinating experience, especially for those who love to live amidst nature. They overlook the valley situated about a kilometer away from the main building. The total silence and quietitude of the valley can be an out of the world experience. There is always an option to fly to Shimla although the flight operates when the weather is favourable. By rail, you can cover Kalka-Shimla track by a toy train which takes five hours from Kalka to get to Kandaghat. This toy train chugs through thickly forested tracks with breathtaking bends, deep ravines and never ending tunnels. By road, Chail is about 86 km from Kalka via Kandaghat, which is roughly about 380km from Delhi. From Kandaghat, it is about half an hour journey by road to Chail. While in winter the temperature can drop below freezing point and heavy woolen garments are required, summer is mild and cottons are recommended. However, every season has something of delight in store for tourists. Chail is charming in summer, fascinating in autumn, covered with a cloak of gold and a paradise in winter. The air at Chail is crisp, invigorating - embrace its kind warmth in the snow.